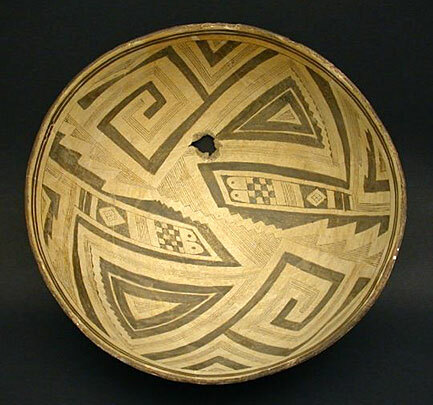 This bowl, of rounded form, is finely painted on the interior with a complex interlocking array of mazes, triangles, checkered and diamond-shaped patterns within concentric angular devices composed of thick and very finely striated lines. Three bands encircle beneath the rim. There is a small kill hole, and two small holes drilled in antiquity to secure an old repair. Dates to circa A.D. 950 to 1150. Condition: There are multiple professional repairs to the body, but aside from very minor in-painting and fill, all the components are original. Provenance: From an old Los Angeles American Indian private collection held for over 40 years.